One of the things I love to do is decorate cakes. I started small and easy when my kids were little. You know the Wilton shaped pans and the billions of little stars? Yeah, those kinds of cakes. I did those for years. I never thought I had the skill or talent to do anything else. Then Ace of Cakes and Food Network Cake Challenges come along and everyone wants a Duff cake. I still didn’t think I had the skill or talent. I definitely didn’t have the know-how. My first couple of cakes were okay, but I definitely needed to learn more. This gallery showcases many of the cakes I’ve made over the years. The good and the not so good as well. I hate when people show only the good things, you know dang well they had some flops. Just be nice and understand that I have learned a lot from my first few attempts. I am totally an amateur and it shows on many of the cakes. The cakes aren’t in any particular order but you can tell which ones are my earliest endeavors. Simple wedding cake with buttercream frosting and rolled fondant flowers. Final Fantasy groom’s cake, scene from the opera. Jungle themed baby shower cake. Wedding Cake – fondant ruffles and fondant flower. 40th Birthday Cake with Martini Glasses and Coach Purse – The cake is frosted with buttercream and the little embellishments are fondant. Skull and Crossbones Cake – decided not to cover it in fondant and went old school with the buttercream stars. My nephew’s Excavator Cake – Yes, it is a mess. It was very hot and I rolled the fondant too thin so it just started melting. The poor scoop is backwards! Can’t believe I did that. My nephew’s second excavator cake – this was supposed to be a joke. My brother asked me at the last minute to make a cake so I told him this was all I could come up with before I brought in the actual excavator cake. Guitar for my nephew’s 16th birthday. This one was fun! Puppy Dog Cake with Water Dish smash cake – For my niece’s first birthday. The puppy dog was made with two round glass bowls (Pampered Chef large and small). I didn’t want to cover it in fondant so went old school with the piping stars. Engagement Cake – The figures apparently are an inside joke regarding their pet names for one another. He asked her to marry him at a winery so therefore the clusters of grapes. Jungle Cake – this is the third one of these I’ve done. Maxine – I freehanded Maxine and then piped in details with buttercream. Farmville Themed Cake – For my brother-in-law’s 50th birthday. You can see a few special additions like canes, pill bottles and little blue pills (Viagra). Tiered 70th Birthday Cake – Royal icing piping and fondant balls with a 70 made from fondant as well. Airplane Cake – my nephew’s second birthday. This one was a pain. It just wouldn’t carve properly, the cake was just falling apart. The wings are actually made from thick pieces of display board and covered in fondant, so non-edible. Beer Mug Cake – for my daughter’s 21st birthday. It’s leaning a bit, I didn’t get the layers even and I should have used cake boards between a couple of layers to make sure they didn’t sink into one another. I don’t remember exactly how many layers but at least 5. Graduation Cake – Three boys in the family graduated the same year so we had a big party for all of them. Supposed to be lockers in their school colors. Graduation cake – just a sheet cake with the infamous Wilton stars. 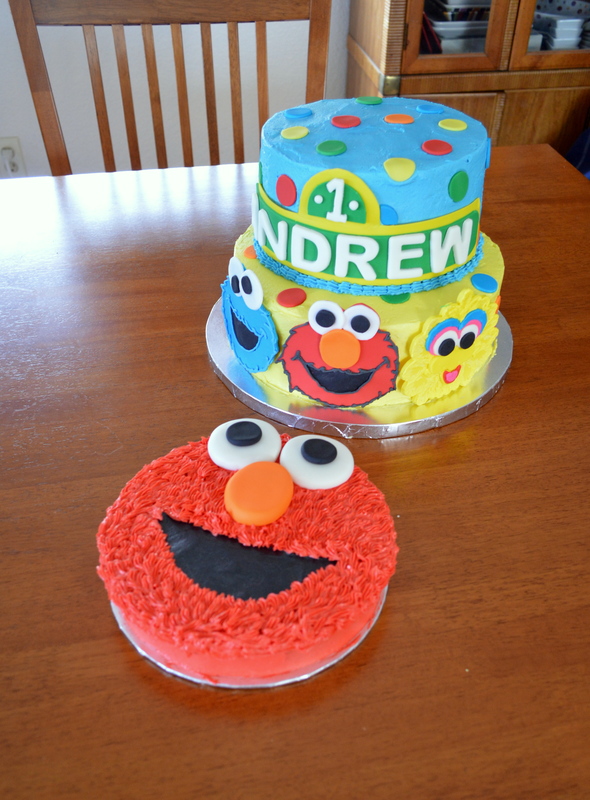 My son prefers this kind of cake over my carved cakes for some reason. The second jungle cake. I also made a small smash cake with a monkey and some bananas. My Little Pony – again. This one is a carrot cake with cream cheese icing, which was difficult to pipe decent stars with by the way. Bridal Shower / Lingerie Party – I thought I was unique when I came up with this idea, but since then I’ve seen them everywhere. Lego Cake – The little legos are fondant with Royal icing dots for the little pegs. The car and the house are rice krispies. Took forever to make the little lego pieces. Jungle Cake – for my nephew. Was the first one of these I did with the little fondant animals. I’ve made a few of these now. Darth Vader – I sketched a template of Darth Vader’s head and then carved a round cake using the template. I then covered the cake in black fondant and to get the details used buttercream icing. The light sabers are fondant. Dolphins – I sculpted the dolphins with fondant and made the shells from chocolate. Topsy Turvy – my first one. Good thing this was just a test. Rock Wall Climbing cake – my first non-flat cake, sort of. The rock wall is rice krispies with fondant covering it. My first attempt at painting fondant. Don’t ask, you don’t want to know. Over the Hedge Cake – just a sheet cake with the little stars. I pretty much free hand these images and then pipe the stars to get dimension and details. Ernie – one of a few I did. Ernie was a favorite of my son. Barbie – The upper portion of her body is a plastic piece that came with the cake pan, you just need to cover it with stars so it’ll blend in with the rest of the cake.